Quote-Core: "But was that what love was supposed to be? Pain? Madness? Or was love something... that motivated a person to be selfless and even self-sacrificing." Maybe it was guilt at the start, maybe it was gratitude after Cass being rescue by Luca in Venom, or maybe his patience during last weeks and his willingness to let her go if she would need it. Who knows. But it turned out that she cares about him and wouldn't give up on his life. That’s why she would go to Florence and try to find The Book of The Eternal Rose, which would help to blackmail and convince Dubois to back off. "Luca’s freedom was at the tips of her fingers." One month. One way. Go Cass! 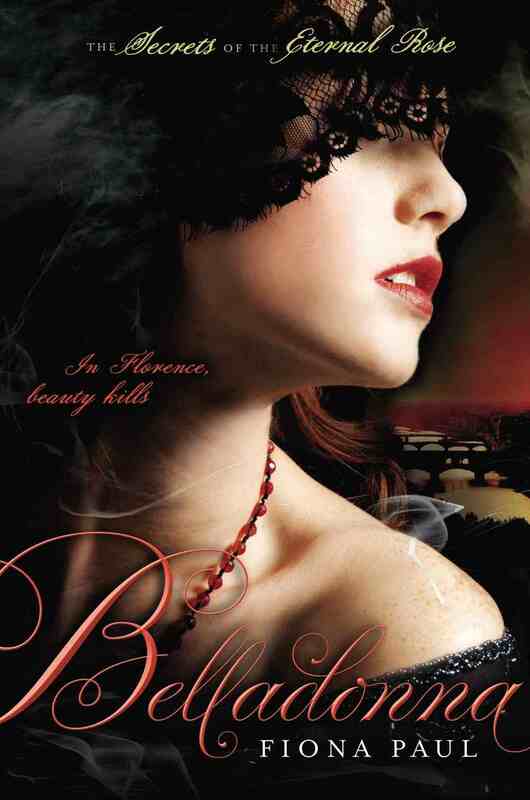 In Florence she will find out that the city is under random vampires’ attacks. Church executes young and not so young women, once somebody sees on their necks certain marks. We and Cass know vampires don't exist and there’s something more behind the wall of superstitions, but things would look creepy anyway. By the by, we won't see much of Florence. I can't tell you why, but no, no tours around the city. Balls, investigations, new characters with questionable intentions, and serious wounds are waiting for our MC instead of touristic trip. The plot was very entertaining, I love how Fiona Paul mixes mystery with romance without overwhelming readers with any of it. And how she covers human's evils with paranormal blankets. The pacing was fast enough (except for a few chapters between Luca's goodbye and Cass's arriving to Florence) and the ending had its twists. But what's more important, I felt the story. I sympathized with the characters and still don't wanna this trilogy come to an end. Let's talk about our heroes. "Typical Falco—get angry first and then think later." He’s here, in Florence, working for a wealthy woman who is, if you believe in gossips, a leader of a local Order of the Eternal Rose, and, if you believe your eyes, loves to be painted in provocative manners. He’s a bit different in this installment. I mean, less light-hearted and easy-going while sharper and more serious. He’s still the same short-temper guy with allusive jokes, but if in the first book he didn't care about Cass's engagement and wanted to enjoy their present only, now he’s ready to fight. Actually, Falco was ready to leave the field: he had left Venice and started a new life. Yes, he thought about new perspectives as of a chance to win the girl, but he knew she could marry Luca before he would make a name for himself and gain a certain amount of money. And still they met again. Despite the odds, they met again. I loved that scene and… I got that when I see Falco I forget about Luca (this rule works both ways, though). "For the thousandth time, she was struck by the differences between herself and Falco. The two of them had lived in the same city, but in completely different worlds. Cass was foolish to ever dream they could be together." Cass says she isn’t married yet and Falco smiles with hope growing in his chest. Cass tells the reason she arrived to Florence and Falco gets moody. It’s one thing to be a wife of a man you don’t love and desire another (who is so desperate that may agree to become her secret lover), but risking your life for the sake of a fiancé you don’t wanna be with… It means only one thing: you do. And if you do then something had changed. Falco understands that he’s losing his starling. (I adore the nickname he gave to Cassandra: starling is such a beautiful word). So when Cass asks Falco for help he doesn’t refuse but doesn’t try his best either. He knows there’s no sense in being jealous, but no one can command his heart. BTW, only in this installment I learned Falco’s surname (I don't know why I had missed it in Venom). And when Belladonna (Falco's mistress) called him Signor da Padova, I felt hot. Italian names make things to me. Ask Luca da Peraga or Piero Basso or even creepy Angelo de Gradi. Okay, I lost my focus. We were talking about jealousy and I was going to tell you that I felt it too! So did Cass. ‘Cause Falco’s relationships with Bella are… suggestive. He may not want her as much as he desires Cass, but she is genuinely interested in him. And everyone knows how she loves young men. So brace yourself, it was annoying even for me (while I knew that their ship was seeming), imagine what it was like for with Cass (she knew nothing). In Belladonna Cass and Falco would share a few passionate moments, but they will also fight not once. I like them together, I’m always first in line to scream at Cass ‘say YES to him and go to his quarters!’, but I see no future for them so far. I did though. But the ending of this book left me confused. "Cass trusted Luca with her life. With her heart." Dear boy, how I like you. Belladonna will start and end with him being on the pages, and while in the middle of the book I was distracted by Falco, after the read I was melting for da Peraga again. One would call him too good to be true or to good to be interesting in. But I disagree. He’s indeed a good man, but he isn’t that simple. He gets in trouble by trying to protect Cass and then asks her to leave him be, 'cause she doesn't have to waste her life too. But I was glad to see Cassandra’s reaction and how happy was Luca to find out that she really cared about him. And a kiss… there was a kiss, after which there was a book without Luca. You won’t see him until the ending, though Cass would think of him quite often. "Luca was the same as she was, when it came to the things that mattered." "Cass tried to imagine Luca gone, but couldn’t. Even when he had been in France studying, he had always lingered in the back of her mind, his letters arriving with almost mechanical regularity. Even though Cass had spent most of her life away from him, she couldn’t fathom being completely and utterly without him. He was her future, a promise left to her by her parents: a life that was safe, steady, dependable." A promise made by her parents. How powerful these words are. Cass's mother and father had seen something in this boy long before Cass’s eyes finally opened. I doubt they would choose him only because of his title or something. And events in Belladonna helped Cass to test her feelings toward Luca. They gave her a choice. Live him or love him. I was surprised with these words. Yes, Falco was angry while speaking it, but you can’t tell something that isn’t already in your head. The very thought has to be there. As we see, Falco considers Luca as a decent rival. And his advantage is knowledge. He knows about Luca while Luca is blind. Honestly, I do hope that da Peraga is actually aware about Falco too, aware and keeps silence only to let Cass choose by herself. ‘Cause if he doesn’t, he will, and it would be painful. What’s worse, I don’t know for whom I’m rooting more, with whom I want Cass to settle. I wish for these men to meet and have a talk (or fight). Maybe it'd help me with the choice. Now I need to run and read the final installment. I'm already done with 25% and have no idea how the story would end. Цитатосуть: «Какой должна быть любовь? Болезненной? Безумной? Или любовь это что-то, что заставляет нас забыть о себе и даже идти на жертвы?». Во второй части «Тайн Бессмертной Розы» Кассандра Каравелло пытается забыть Фалько, взбалмошного художника, сбежавшего из Венеции вместе с ее сердцем, а еще сближается с Лукой, своим женихом. Но у Луки есть тайны. Его арест посреди ночи повергает жизнь Касс в хаос. Она должна помочь жениху, а для этого нужна найти «Книгу Бессмертной Розы» — единственное доказательство его невиновности. Ей придется отправиться во Флоренцию, город, охваченный историями о вампирах, тайных сборищах и балах под эгидой Ордена Бессмертной Розы. Здесь же живет и Фалько, работающий на Белладонну, потрясающей красоты женщину и главу Ордена по совместительству. Сможет ли Касс в этот раз довериться сердцу, чтобы открыть правду? Здесь все не то, чем кажется, а истина может стать смертельной страшного яда. Все начнется с ареста Луки и назначения даты его казни. Спасибо синьору Дюбуа, без него да Падова вряд ли решил бы сменить комнату в палаццо Кверини на подземелье Дукале. Лука попросит Касс забыть о нем и жить дальше, в конце концов, к нему у Кассандры чувств никаких нет, а так его жертва не будет напрасной (ведь в тюрьму он угодил, пытаясь обезопасить невесту). — Ты ничего мне не должна. Пусть тетя найдет для тебя другую достойную партию. Возможно, кого-то, кого выберешь ты. Будь счастлива. Это все, чего я хочу. Но чувства есть. Возможно, все началось с вины, благодарности и долга. Лука спас ей жизнь, позволил сделать выбор относительно их будущего, не давил, не мешал и просто был рядом. Если бы Касс сказала: «Ну ок, пойду поищу Фалько». Я бы ее прибила. Достала из книги и четвертовала. Но, оказалось, совместное детство и недавние приключения пробудили в Кассандре некое подобие любви или привязанности, а нежданные обстоятельства все обострили. И слава богу. Потому что, клянусь, за Луку я бы ей двинула. «Касс попыталась представить, что Луки на свете нет, и не смогла. Даже когда он уехал учиться во Францию, где-то на подсознании он оставался с ней, а письма его приходили с отточенной регулярностью. И пусть большую часть жизни Касс провела вдалеке от Луки, ей не удавалось вообразить его абсолютно-необратимое отсутствие. Он был ее будущим, обещанием, данным ее родителями; залогом верности, стабильности и безопасности». Обещанием родителей. Подарком тех, кого уже нет. Чтобы помочь жениху, Кассандре придется отправиться во Флоренцию и отыскать пресловутую «Книгу Бессмертной Розы», с помощью которой можно будет шантажировать Дюбуа, чтобы заставить его отозвать обвинения в адрес Луки. Флоренцию мы не особо увидим, почему сказать не могу. Зато узнаем, что город облюбовали вампиры. Они нападают на юных дев и женщин постарше, оставляя на них метки. Что делает церковь? Казнит любую, на чьей шее кто-то увидит след от укуса. И пусть читатели в курсе, что мистика лишь прикрытие для человеческих злодеяний, жути не избежать. Местами было реально не по себе. Особенно ночью. А Катя читает ночью! Кассандра увязнет в интригах тайного общества, угодит в крупные неприятности и познает ревность. А я не говорила, что Фалько, покинув Венецию, отправился во Флоренцию? Именно здесь живет госпожа, которой пришлась по душе его арт-техника и которую он теперь неустанно рисует, пока та протежирует юношу в высшем свете. Клиентура растет, слава не за горами. Одна проблемка - Белла (ака Белладонна) любит позировать чуть ли не обнаженной (а порой и обнаженной) плюс не скрывает, что падка на молодых и красивых людей. В ее доме служат шикарнейшие мужчины, да и она недурна собой. Женщине сорок лет, но выглядит Белла на двадцать. Причем во всех отношениях. В чем же ее секрет? Ой, да Кассандре плевать! Видали мазню чуть ли не в каждой комнате? Фалько посмел рисовать хозяйку в той же позе, что и ее. И доступ имеет в ее спальню. И эти взгляды. Вот так причитала Касс. Да я и сама, если честно, хотела рвать и метать. Опять же, ясно, что автор нарочно так нагнетает и между Фалько и Беллой романтиков нет. Но некоторые ситуации зародили сомнения даже во мне, что говорить о Касс. Вообще-то сначала всё было нормально. Случайная встреча после скоропалительного расставания. — Присядь-ка и выпей. Обещаю доставить тебя в целости и сохранности к атласным простыням, как только мы вновь узнаем друг друга. Сначала Касс рассказала, что так и не вышла за Луку (у Фалько замерло сердце), а затем поведала о причине, приведшей ее во Флоренцию. И этой причиной был вовсе не юный художник (вот тут сердце разбилось). Затем попросила помочь отыскать книгу, тем самым выручив да Перага, на что Фалько ответил согласием, но из кожи вон лезть не стал. И я его понимаю. К слову, Фалько больше не тот легкомысленный парнишка с двусмысленными шутками. В этой книге он стал серьезней, жестче, теперь он знает, чего хочет. В первой части его не волновала помолвка Кассандры, он жил настоящим, а когда влюбился, должно быть, решил, что смирится с ролью любовника, если уж Касс придется-таки выйти замуж. Но одно дело смириться с фиктивным браком, с мужчиной, к которому Касс холодна. И другое — понять, что к Луке она далеко не равнодушна. — Я сочувствую, Касс. Но тебе придется принять тот факт, что да Перага вскоре умрет. — В мерцании свечей глаза его потемнели. — Порой я хочу, чтобы казнь поскорей состоялась, и скворушка вновь вернулась ко мне. «Типичный Фалько — сначала вспылит и лишь потом подумает». Так-то да, но чтобы что-то сказать в сердцах, мысль изначально должна быть в голове. А значит, Фалько всерьез рассматривал ситуацию, как способ избавиться от соперника. Теперь-то он понял, что Лука не просто мебель. «В тысячный раз Касс поразило то, насколько они разные. Вроде и жили в одном городе, а будто бы в разных мирах. Какой же она была глупой, когда решила, что у них что-то могло получиться». Связь с Лукой куда прочнее. «Лука был ее отраженьем, когда дело касалась действительно важных вещей». Вот именно. Если отставить физическое притяжение, Фалько и Касс есть тупик. Он весь из себя человек науки, свободных нравов, ярый противник церкви. А она не фанатичка, но религию уважает. И это только макушка айсберга. Еще любопытно, что Фалько соперника знает в лицо, а Лука вообще ни сном ни духом о существовании художника. Я, если честно, надеюсь, что да Перага прекрасно осведомлен о том, что у Касс закрутилась интрижка, и просто молчит, чтобы та сама сделала выбор. А если же нет... он непременно узнает, и кончится это плохо. А еще я хочу, чтобы Лука и Фалько встретились. Поговорить там или подраться. Возможно, я наконец решу, кого из них назвать моим фаворитом. Пока что я вполне понимаю обоих: пока на страницах Фалько, я забываю о Луке. И наоборот. Читать очень интересно. Пол классно миксует романтическую линию с детективной, нагоняет страху, создает атмосферу и динамично закручивает сюжет. Удастся ли Касс спасти Луку от смерти? Что за ересь с вампирами? Отчего героиня в спешке покинет Флоренцию? Точнее, в спешке и расстроенных чувствах. Чем закончится встреча со стаей диких собак? Что нужно Пьеро Бассо и зачем де Гради тоже приехал в город? Срочно читайте и узнавайте, а я отправлюсь знакомиться с третьей и заключительной частью «Тайн Бессмертной Розы».